All computer wheel balancers require the user to input rim diameter, rim width, and the distance of the mounted wheel from the wheel balancer. The WB-580 requires the user to input all three of these measurements. The WB-800 requires the user to only enter the wheel width. The other two measurements are automatically entered by simply touching the distance ruler to the mounted wheel. This decreases labor time and user error. Time saved is estimated at 25%. The WB-800 also includes a foot pedal wheel brake to hold the tire in place while you install the weights. ER100 EVO - Fully Automatic laser wheel balancer, touch screen with automatic entry by laser (3D), spotter laser system, full-time Static on screen, pneumatic locking, radial runout, Zero weiht lift and 2" wheel guard standard. The only Truck Balancer in the world with PNEUMATIC LOCKING! 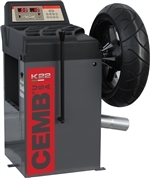 - Industrial Video Truck Wheel Balancer - CEMB truck tire production balancer for non-stop continues 24/7 use on performance tires and others. Comes fully assembled! A Digital Wheel Balancer specifically designed for Motorcycles and Scooters offers both Static and Dynamic balance with automatic input of distance and diameter entry. Balanced wheels and tires are critical for safe and comfortable driving. Due to the tire manufacturing process, tires are not perfectly balanced when they are installed on a wheel or rim. Variations in weight around the circumference of the tire can cause anything from slight vibrations to major shuddering at low, medium or high speeds. To counteract this imbalance, wheel installers use a wheel balancer machine to determine where the imbalance is coming from and help you apply weight where it’s needed. While the basic principle behind wheel balancing hasn't changed over the years, the sophistication and precision of the equipment have. Here at North American Auto Equipment, we pride ourselves on offering some of the most advanced auto body repair and automotive service equipment on the market. We carry top-quality products that give you value, performance and reliability so you have the confidence to offer perfect wheel balancing to your customers every time. Depending on the type, size and quantity of tires you balance, you'll want to choose the perfect wheel balancer service equipment. We carry many different models so you don't have to settle for “close enough.” Instead, opt for the wheel balancer that works perfectly for your business and gives you the best results as well as the best return on your investment. Portable units: Perfect if you only have periodic wheel balancing needs and would like to be able to move the machine when you need it elsewhere or it isn’t in use. Passenger vehicle electronic balancers: Choose one of these models if you balance a range of wheels from cars, small trucks and compact SUVs. Truck and SUV balancers: These models are suited to large and heavy truck and full-size SUV tires and have enough space and clearance for off-road tires as well as snow tires. Motorcycle wheel balancers: Balance motorcycle and scooter wheels with the same ease as standard automotive tires with a purpose-built motorcycle wheel balancer. Motorcycle wheel adapters: While direct installation of a motorcycle wheel on an automotive balancer isn’t possible, a simple adapter allows you to balance this type of wheel as well. Video balancer + diagnostics: For the best technology available, opt for our video balancing and diagnostics unit, which helps you pinpoint and correct wheel balancing issues. With so many different options, you might not know where to start. We invite you to browse our always-changing online catalog of wheel alignment service machines and read up on the different specs. Pay close attention to the range of wheel sizes each model can handle and select a machine that covers your needs. You can also contact one of our team members for more information by filling in our online contact form or giving us a call. It would be our pleasure to discuss your automotive or motorcycle wheel balancing needs with you and point you to the right equipment. We never pressure our customers into buying equipment. Instead, we take the time to understand your business and expectations and help identify the right wheel balancer. And if we don’t have the right machine, we’ll tell you so! You won’t find that kind of customer service just anywhere, so come and learn how we’ve earned our reputation as the online leader in auto equipment and wheel balancers. North American Auto Equipment started small like most of you did. We understand the value of a dollar and know that you want the best value for your money. If you find the right wheel balancer on our site but don’t have the cash available, no worries. We can offer competitive financing rates to help you purchase the equipment you need today. Don’t put off buying a wheel balancer service machine and watch as your competition steals all your wheel business. Instead, choose one of our attractive financing options and start perfectly balancing your wheels today. We also carry various wheel cone adapters (for trucks and SUVs, for example), so check out our list of accessories before you place your order and make sure you’re properly equipped to balance all types of wheels.